We theologians are often accused of writing a lot of nothing about God, which occasionally may be the case. But it takes a careful hand to write a lot about God and nothing. “Nothing” is an undeniably slippery concept. As soon as you make a statement about it, you’ve gone and turned it into something! But, if Ian McFarland is to be believed, we can’t just let the nothing be. It simply won’t do to go about life carelessly ontologising nothing. Theology must grapple with nothing, which is to say, it must cease trying to grapple with nothing as though it were something (because it looks rather silly to wrestle with the air). McFarland has called his book From Nothing. I often berate my students for beginning their essays with clichés, such as “Since the beginning of time…” However, after reading From Nothing, I think that I have been mistaken. I should be praising my students and their clichés. After all, they have demonstrated that they have the theological sense to discern that time has a beginning. This is a fine point to make, as long as one doesn’t make it too finely. Once the theologian starts discussing what existed “before” creation, the language can get rather muddled—since the whole discussion employs a creaturely temporal framework. Of course, some theologians claim that an awful lot existed before creation, even if the things that did exist were the wrong shape and all the bits were in the wrong place. The doctrine of creatio ex nihilo is sometimes accused of being alien to the Bible—a downright unscriptural philosophical intrusion into the theological purity of the Christian tradition. The students of Whitehead continue to tell us that ex nihilo—if nihil really means nihil—makes God responsible for the evils of the world. The creation narrative presented by process theism provides a tidy solution to the problem of evil: a God whose creative activity is limited to the persuasion of pre-existent matter cannot be held accountable when that obstinate matter shapes itself into unpleasant things like lawsuits and fire-ants. McFarland is aware of the critiques of ex nihilo, and addresses them by looking at the history of the doctrine. Our first written expression of ex nihilo seems to appear in Theophilus’ letter to Autolycus. “While the gnostics used the doctrine of creation as a theodicy, for Theophilus it no longer plays this role. Evil cannot be explained as a natural consequence of creation… Theophilus turns [the doctrine of creation] to the service of soteriology”. Theophilus saw that salvation of the material world hinges on God’s transcendence of the same. This little history uncovers the principal theme of the book: it is because God transcends the world that God has an interest in the future of the world. Without transcendence, God would be subject the fate of the world, but the transcendent God is the subject of the fate of the world. The affirmation that God creates from nothing is simply another way of saying that “nothing limits God”. God’s creative activity is not conditioned by any environment or matter or circumstance. The Gnostics share with the process theists a disappointingly timid notion of divine transcendence. A truly transcendent God doesn’t need a demiurge. “God’s transcendence does not imply distance from creatures but is rather the ground for God’s engagement with them”. Unlike this blog post, McFarland’s book does not degenerate into doctrinal polemics. Instead, he puts the doctrine of creation to use—he reveals its problems and promises. When examining an ancient doctrine such as this, one can be either an archaeologist or an engineer. The archaeologist attempts to uncover the ancient use of the doctrine, and perhaps argue for its continuity up until today. The engineer, on the other hand, attempts to build something on the doctrine. McFarland plays the engineer. The strongest case for the doctrine is made, he argues, when one can “identify its dogmatic function” rather than merely establishing “its grounding in Scripture or tradition”. McFarland builds his case upon topics such as evil and providence, glory and light, Christ and icons. McFarland is a fine engineer. He understands how the structure works, and shows that divine transcendence and creatio ex nihilo support and strengthen each other. 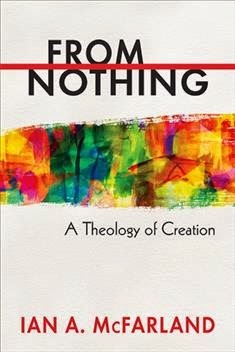 It might be possible to compare this book to Kathryn Tanner's God and Creation in Christian Theology, but I cannot think of another volume that treats the topic of creatio ex nihilo as well as McFarland does here. McFarland shows that when theologians talk about God, they talk about nothing. They just need to find a way to do it that allows God to be everything before there is anything else.